Join the fun! Taste the Results. Vote for your favorites. Enjoy the creativity of our cooks with dishes cooked on the Big Green Egg along with demonstrations, live music, kids' activities, ENCO Sports Zone, Knob Creek Smoked Cocktail Seminars, and more. It’s a tough job but somebody’s got to do it. Come and enjoy a day of delicious foods cooked on the Big Green Egg during this friendly competition. Food will be coming off the Big Green Eggs by 30+ cook teams so come hungry! Vote for your favorites and three teams will earn the coveted "People's Choice" Awards. 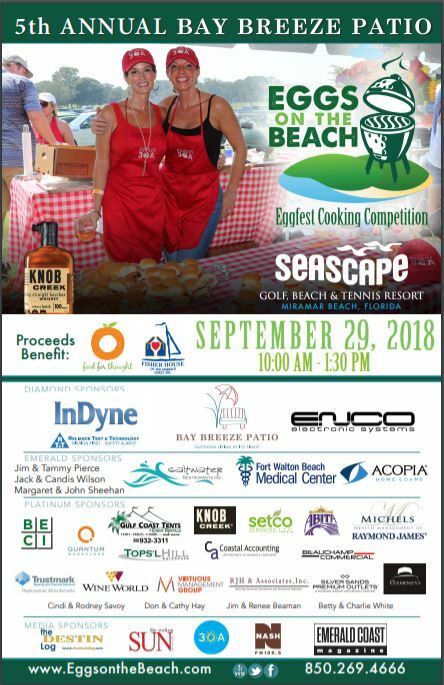 Eggs on the Beach will take place at Seascape Resort in Miramar Beach rain or shine on Sept. 28, 2019 from 10 a.m. - 1:30 p.m. The event includes tastings, live music by Austin Jennings, cash bar with beer, wine and sodas, ENCO Sports Zone, kids' activities, and more. All proceeds benefit the Fisher House of the Emerald Coast and Food for Thought. Knob Creek Craft Cocktail Seminars. For attendees 21 years of age and older, Knob Creek, in partnership with the Craft Bar, will present craft cocktail seminars and tastings that complement the delicious bites. In addition, Knob Creek will have an etching machine to engrave bottles of Knob Creek for a commemorative gift or souvenir from the day. Abita Beer Craft Beer Seminars. Abita Brewery, located outside of New Orleans, brews small batches, hand-crafted by a dedicated team. Abita team members will hold a presentation on trends in craft beer and feature samples of their most popular and seasonal brews including “Hop On” IPA. Live Music by Austin Jennings. The delicious day will be complemented with live music by Austin Jennings. Originally from the Tennessee Valley, Jennings has been earning fans along the Emerald Coast with singer/songwriter style and diversity of genres from country to alternative. ENCO Sports Zone. This is the south and college sports take priority. The ENCO Sports Zone, sponsored by ENCO Electronics, will feature big screen televisions with the top college games and scores. Kids Zone. Eggs on the beach is fun for parents so there will be something for kids too. Sponsored by Forever Lawn, there will be lawn games and kids water play area. Food for Thought team members will also offer arts and crafts and cold treats. (Kids 12 and under must be accompanied by a parent). Have you thought of owning a Big Green Egg? Demo Eggs are available for pre-sale at a substantial discount. Eggs will be available for pick up on Saturday, 9/29 from 3-5 p.m.
Tickets may be purchased in advance for $32.50/adult and $14/child. Children ages 10 and under free with paid adult.